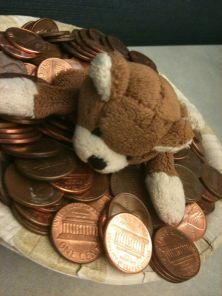 024 | The Great Adventure's of Cubicle Bear! IB slips around the cubicle wall to a desolate corner of Cubicleville. The desk surface is littered with flax crumbs and shiny candy wrappers. Our hero silently makes his way to the target. In a more oafish and amateur manner, Dino stumbles after IB. IB: OK, Dino, you’re on lookout. This is dangerous territory, this is. We are standing on the veritable epicenter of all things platypus! Dino: I thought it was platypi. IB: Neh, I’ve heard it both ways….sniff how that platypi smell lingers in the air. Dino: I thought we were here for the copper. IB: True enough, my friend. The platypus eggs will have to wait. IB dives into the copper bowl. IB: Let me know if..
Dino: The native! The one who likes needless violence! He’s coming back! IB, RUN! Get out of there, IB! IB: The copper pieces! They are pulling me under. 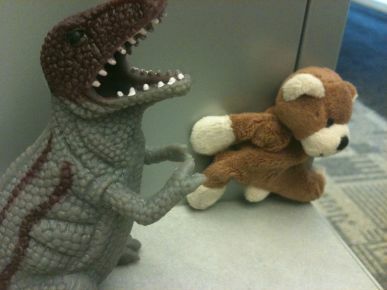 Save yourself Dino!